Lotus Notes and MS Outlook are the leaders in the industry of professional email clients. Lotus Notes from IBM whereas MS Outlook is from Microsoft. Their simplicity and security make them stand out and be the preferred choices for both individual and enterprise level users. Organizations use these email clients to work with emails, notes, calendar entries, journals, and more. Despite having a similar functioning, they do not support the format of each other. They have different file formats for data storage, i.e., Lotus Notes uses NSF file format, and MS Outlook uses PST file format. Professionals switching their jobs (new office environment may be having MS Outlook). Email client is different at the Office and home. If we count the benefits, then Outlook has some advantage in terms popularity. There are several benefits and features such as maintenance cost is low, no special configuration is required for installation, training cost is low, user familiarity is high and much more. When users migrate from Lotus Notes to Outlook, a need arises for NSF to PST conversion. 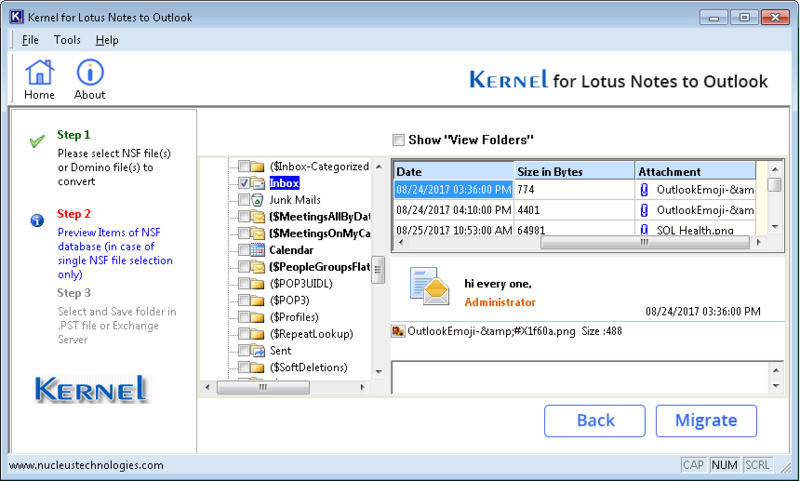 A popular tool used for NSF to PST conversion is Kernel for Lotus Notes to Outlook. Before we move ahead with process of using the NSF to PST Converter free and full versions, let’s take a quick overview of the software features, and functionality. We will take you through the NSF to PST migration process using both the free and full versions of the NSF to PST Conversion tool. 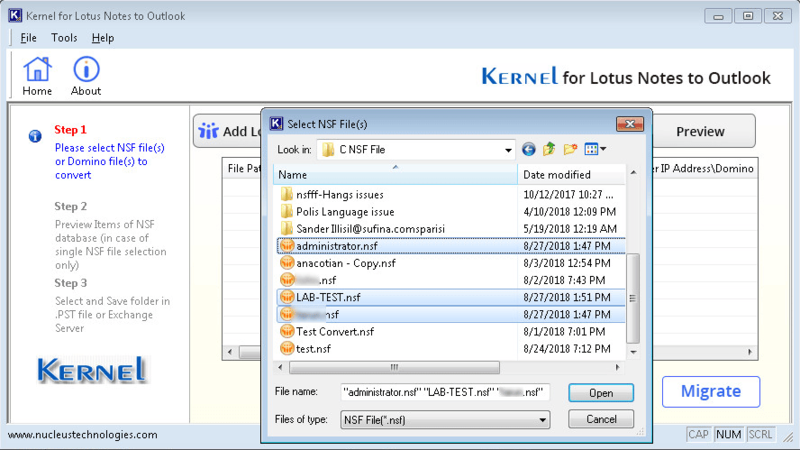 Kernel for Lotus Notes to Outlook is an expedient tool that helps you migrate your NSF files to PST file format with no data loss. The latest version 17.2 gives a new experience with faster conversion, better accuracy, efficiency, and better quality of email body after migration. There are many other technical updates with the backend algorithms to ensure integrity of your NSF data. After ensuring the minimum system requirements on your system, you need to download the free version of the software. The trial version of the software offers same benefits and features as the full version, but with limited data saving options. You can save only 10 items from each folder, though you can preview the entire data. But the licensed version saves all the NSF data in PST or Exchange Server as per requirement of the user. We will explain the migration process using the licensed version below, as both the versions have the same procedure. Note: Your system should be installed and configured with working Lotus Notes and Microsoft Outlook for flawless NSF to PST conversion. Lets’ start with the process of migration from Notes to Outlook in these simple steps. As shown in the image below, select Add Files, and browse to the location where you have saved the NSF file. Select the required NSF files and click Open. Note: The tool offers migration of NSF to PST in two modes, Standard and Advanced mode. In the Standard mode, you can manually select NSF files to migrate to PST whereas in Advanced Mode you can do it using a CSV file. Click any folder of the NSF files to preview its data (the preview option is available for one file at a time). To save the data, select the required folders and click Export. 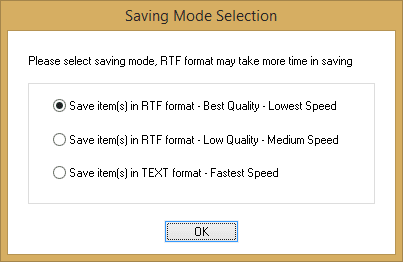 A dialog box will appear offering saving options. 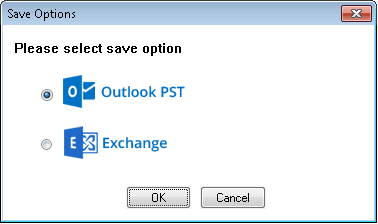 Select Outlook PST and click OK.
After, clicking OK, the tool gives you the option to select saving location and perform mapping. Then, click OK.
Then apply suitable filters and click OK.
Now, you will see three options to save your converted data, select any one and click OK. The saving process beings. 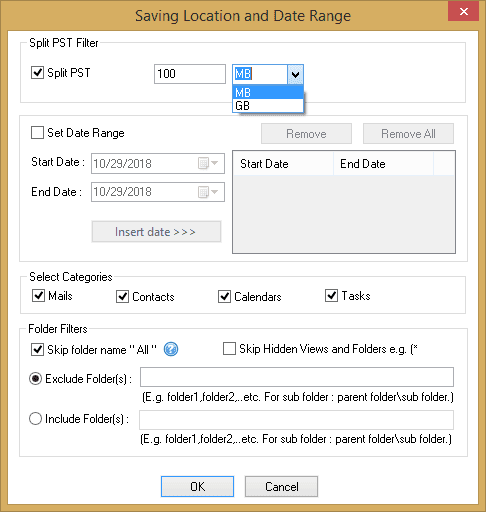 Once the saving is complete, you will see a dialog box showing the location of the saved file. Click OK. The process of migrating Lotus Notes to Outlook is possible with this amazing software – Kernel for Lotus Notes to Outlook. The process is very secure and reliable. If you want to check the features and functionality of the software, you can download the trial version of the software and later register for the full version.